View this sample resume for a police officer, or download the police officer resume template in Word. If you’re patrolling the job market for a dependable career, law enforcement is a solid choice. A comprehensive resume can help you be considered for top police officer jobs, resume expert Kim Isaacs says. 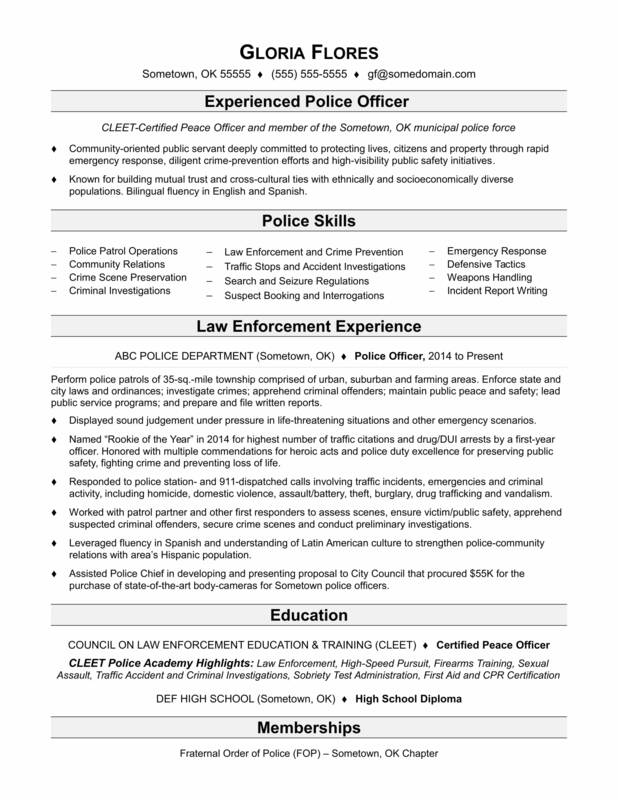 For resume writing tips, view this sample resume for a police officer that Isaacs created below, or download the police officer resume template in Word. Jobs for police officers are projected to grow by 7% (or 53,400 jobs) from 2016 through 2026, according to the Bureau of Labor Statistics (BLS). Unsurprisingly, you'll find the highest level of employment for this law enforcement job in the following populous states: California, Texas, New York, Florida, and Illinois; and in the following metropolitan areas: New York City, Los Angeles, Chicago, Houston, and Washington D.C. In terms of salaries, as a police officer, you can expect to earn a median wage of $61,050 per year, or $29.35 per hour, according to the BLS. Additionally, you can search for police officer jobs on Monster. Community-oriented public servant deeply committed to protecting lives, citizens and property through rapid emergency response, diligent crime-prevention efforts and high-visibility public safety initiatives. Known for building mutual trust and cross-cultural ties with ethnically and socioeconomically diverse populations. Bilingual fluency in English and Spanish. Perform police patrols of 35-sq.-mile township comprised of urban, suburban and farming areas. Enforce state and city laws and ordinances; investigate crimes; apprehend criminal offenders; maintain public peace and safety; lead public service programs; and prepare and file written reports. Displayed sound judgement under pressure in life-threatening situations and other emergency scenarios. Named “Rookie of the Year” in 2014 for highest number of traffic citations and drug/DUI arrests by a first-year officer. Honored with multiple commendations for heroic acts and police duty excellence for preserving public safety, fighting crime and preventing loss of life. Responded to police station- and 911-dispatched calls involving traffic incidents, emergencies and criminal activity, including homicide, domestic violence, assault/battery, theft, burglary, drug trafficking and vandalism. Worked with patrol partner and other first responders to assess scenes, ensure victim/public safety, apprehend suspected criminal offenders, secure crime scenes and conduct preliminary investigations. Leveraged fluency in Spanish and understanding of Latin American culture to strengthen police-community relations with area’s Hispanic population. Assisted Police Chief in developing and presenting proposal to City Council that procured $55K for the purchase of state-of-the-art body-cameras for Sometown police officers. You know the law, but do you know how to write an effective resume that can get you hired? Need some help with that? Get a free resume evaluation today from the experts at Monster's Resume Writing Service. You'll get detailed feedback in two business days, including a review of your resume's appearance and content, and a prediction of a recruiter's first impression. It's a quick and easy way to put some extra polish on your resume so that you can have an awesome job search.